The mythology built up around Major League Baseball 2K is that the game could not do anything right. Eight-figure losses and terrible review scores every year are, yes, terminal deficiencies. But its pitching and hitting mechanisms forced the dominant MLB The Show to respond with weak revisions to its controls, and MLB Today—when it worked—was the freshest introduction in a main mode of play since the singleplayer career. And, if the series is truly finished, there is a still greater legacy Major League Baseball will leave: It created 2K Games. That's right, 2K Games, not just 2K Sports. See, the other mythological component of MLB 2K's Greek tragedy is the origin of its hated exclusive license, the one that effectively made it the only baseball game available on the Xbox and, then, the Xbox 360. It was viewed as a desperate, if not spiteful swipe back at Electronic Arts, whose exclusive deal with the NFL killed NFL 2K5, still mourned by gamers with Arthurian longing. But Sega lost out on that football deal—not 2K Sports, which didn't even exist in 2004. The 2K line of sports video games developed by Visual Concepts was owned and published by Sega until 2005. And Sega's decision to cut the price of NFL 2K5 to $19.99 delighted customers, but offended a league that views itself as anything but a discount brand. And that would prove fatal to one of the last vestiges of Sega as a maker of consoles and games for them—the 2K line had been created for the Dreamcast, after all. At the end of 2004, Sega was looking to rid itself of an expensive disappointment. Enter Take-Two Interactive, founded by Ryan Brant, heir to a newsprint fortune and barely 32 years old at the time. Though no longer Take-Two's CEO or a member of its board, the company still reflected a young, aggressive, risk-tolerant approach. Take-Two had hit the jackpot when it acquired Rockstar Games in 1998 and, three years later, published Grand Theft Auto III, a landmark title in video gaming. With nearly a quarter of a billion dollars, Take-Two bought into a high stakes poker game it would lose big. Sega sold Take-Two the 2K line of sports video games and the two studios for $24 million, creating not only 2K Sports, but 2K Games, on Jan. 25, 2005. That same week, Take-Two inked the now-infamous deal with Major League Baseball. News accounts at the time speculated it was worth $200 million in sum. This money—nearly a quarter of a billion dollars for the license, the games, the brand and the studios—represented the buy-in to a high-stakes poker game that Take-Two's old management regime would ultimately lose, and lose big. Major League Baseball 2K began life as the centerpiece of not just a specialty label, but of a new games division, which added Sid Meier's Firaxis studio later in 2005. Major League Baseball 2K5, the last game published without the exclusive license, scored reasonably well but was still outperformed by EA Sports' MVP Baseball 2005, which occupies a space in gamer nostalgia similar to NFL 2K5. The next year, the wheels fell off. Major League Baseball 2K6 landed with a thud on the PS2 and Xbox, cited for bland execution and a lack of polish, no doubt hurt by the loss of the ESPN presentation gamers had enjoyed in the 2K lineup. On the Xbox 360, it was even worse, savaged by bugs that reflected a studio caught flat-footed by the new hardware generation. Elsewhere, 2K Games had bloomed into a reasonably robust label, featuring Sid Meier's Civilization series surrounded by licensed adaptations of films like Fantastic Four and The Da Vinci Code, agreements much less expensive compared to the licenses needed in a sports video game. It was also the publisher, for PC and Xbox 360, of The Elder Scrolls IV: Oblivion, an enormous success in 2006. More importantly, BioShock was shown at E3 that year, and Ken Levine's dystopian epic figured to be another huge coup for the publishing label. But 2K Games and Take-Two Interactive still had big problems. In February 2007, Brant, the founder, pleaded guilty to falsifying business records in a scandal involving backdated stock options. The company also lost nearly $185 million in its fiscal year ending in 2006. Investors, fed up with careless governance and spiraling losses, staged an insurgency that fired five of six members of the board of directors and seized control. Strauss Zelnick, who led the charge, was installed as the board chairman that year. He became CEO in 2010. By now, MLB 2K was being blamed for $30 million in annual losses, thanks to the hubris of the deal cut by the former regime. Bugs, framerate drops and embarrassing glitches returned in force for 2008, followed by the total collapse of MLB 2K9. Kush Games' closure in 2008 meant Visual Concepts would inherit the project on a nine months' production schedule, and MLB 2K9 reflected the last minute change in design ownership. Spinoff titles like Front Office Manager failed to draw anything at the cash register, and it was becoming clear that the MLB deal was anchored by a product whose name was now irrevocably tarnished. Zelnick was now openly calling the license a money-loser, the kind of mistake his investor revolt was formed to scrub away. And indeed, the culture of Take-Two and its two labels, Rockstar Games and 2K Games, was now prioritizing wholly-owned franchises and ensuring high-quality releases in them, as opposed to adaptations that required licensing payments and outside creative approval. Whatever you think of MLB 2K, the 2K Games label sprang from the deal that created the series. That focus manifested itself in the release of 2K Games titles like BioShock and Borderlands and, though Mafia II released to mixed reviews, its development was indicative of that philosophy. It's noteworthy that in the future release calendar Take-Two issued on Tuesday, as its fiscal year drew to a close, there is only one licensed title on the list: the critically acclaimed sales winner NBA 2K13, likely the sole survivor of the 2K Sports label. Take-Two said it expects to halve its losses from the Major League Baseball 2K franchise in the coming fiscal year, and completely zero them out in the one following that, indicating abandonment of that product once its license with Major League Baseball expires this year. A carefully worded statement from a Take-Two spokesman didn't outright announce the termination of MLB 2K—there's a show on Spike TV tomorrow about the game's Perfect Game contest, after all. But all signs point to the end of the road. It would take an extraordinary reversal of corporate posture for Take-Two to end up publishing a simulation baseball title next year, considering the pain and the embarrassment it has caused, and the fact its name conjures so much disappointment for Xbox 360 baseball fans, who have had to suffer MLB 2K's manifold failures while hearing nothing but glowing praise for the PS3-only MLB The Show. 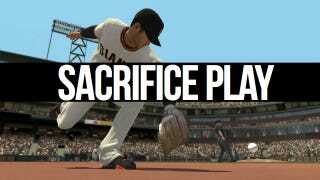 But whatever you think of Major League Baseball 2K, the 2K Games label sprang from the deal that created that series. And it has published some damn good titles. That's not good enough to save a bad game, but it is a legacy, however bittersweet.